Creating a digital silhouette to improve posture in the workplace. The start-up will be at La Poste’s French IoT stand at CES 2019. 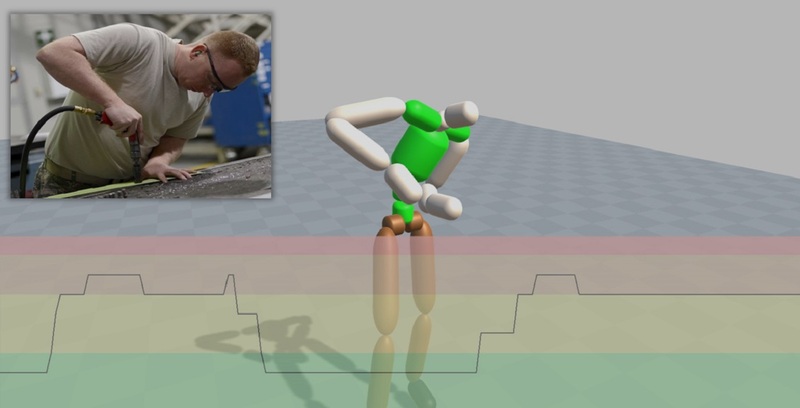 KIMEA (Kinematics Measurement for Ergonomic Assessment) is a type of software that assesses and quantifies the risk of musculoskeletal disorders (MSD) in factories, workshops and outdoor work areas using just one single depth camera, in line with the principles of Kinect technology (see box). The software automatically and accurately estimates MSD risks as operators go about their work. Moovency is a new start-up from Rennes in France, created in 2018 by Pierre Plantard et Franck Multon, both biomechanical and IT researchers, specialising in optimising motor performance and human movement analysis for top-level athletes. Specialists in detecting musculoskeletal disorders, today, Moovency is a team of five, including an ergonomist, a workplace psychologist and an IT specialist. Kimea's Moovency solution does not require significant investments and special skills. It quantifies the risk of MSDs from a single depth camera and requires no sensor or specific technical expertise. By modeling the operator's silhouette, this camera offers an accurate analysis of the causes of MSDs. 20% of the population is affected by workplace illnesses, of which 87% are musculoskeletal disorders. Every year, 40,000 new people suffer from MSD caused by their working environments. The Rennes-based team behind Moovency have developed a concept to automatically detect these risks using a depth of field camera. These types of cameras, initially developed for the video games industry, cannot be used directly in factory conditions, as objects - whether static of moving - get in the way of the cameras and workers, which can lead to significant measurement errors. But the algorithm developed by KIMEA means this technology can now be used in these kinds of scenarios, providing reliable assessments of workers’ postures. On a computer screen, a digital silhouette is reproduced that models the workers’ movements as they operate their machines. The goal is to automatically detect any potential causes of musculoskeletal disorders at workstations. This method provides a diagnosis based solely on a depth of field camera and the algorithms developed by the Moovency team. More information is available on the Moovency website. The sophisticated technology in this capture device is widely used in gaming and entertainment technology designed for the general public. A beam of infra-red light is projected onto an object, capturing images that are then processed by a sensor to reconstruct the depth (the larger the infra-red point is, the closer it is). Unlike traditional optical systems that use markers (where white spots are placed on a moving object or individual), this technique only requires a single camera, without any significant preparations needed.